NSW Health partners with RIDBC to establish Bone Conduction Implantable Device pilot program. In June 2016, NSW Minister for Health, the Hon. 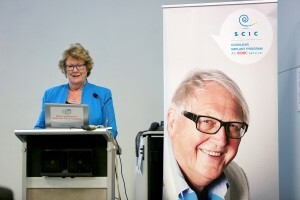 Jillian Skinner MP announced $1.071 million to establish a Bone Conduction Implantable Device (BCID) pilot program, in partnership with SCIC Cochlear Implant Program, an RIDBC service. NSW Minister for Health, the Hon. Jillian Skinner MP announcing NSW Health’s funding contribution towards a Bone Conduction Implantable Device (BCID) pilot program. BCIDs are used in cases of conductive hearing loss, mixed hearing loss and single sided deafness when conventional hearing aids do not provide sufficient access to sound or are contraindicated due to anatomical or chronic middle ear conditions. The pilot program will improve the lives of adults with hearing loss across NSW, providing funding for 30 devices per year for three years, until 30 June 2019. Device allocation and management of waitlists will be based on the program’s clinical protocol selection criteria and priority ratings. SCIC Cochlear Implant Program Medical Director, A/Prof Catherine Birman said that the establishment of this pilot program complements funding the NSW Government provides to public patients for cochlear implants. “The evaluation of the pilot program is critical in the establishment of a longer term publicly-funded BCID program.” said A/Prof Birman. De-identified and grouped patient data will be evaluated throughout the pilot program. “Hearing loss affects one in six Australians, and can have a significant impact on a person’s ability to work and lead the life they choose. For many, hearing loss cannot be treated with traditional hearing aids, so access to implantable hearing devices is life changing.” said A/Prof Birman. Access to the program is available through SCIC Cochlear Implant Program’s network of surgeons and audiologists, as well as other surgeons and audiologists who are participating in the pilot. SCIC Cochlear Implant Program will manage the pilot and administer funding allocation. SCIC Cochlear Implant Program, an RIDBC service, supports people of all ages to access a range of implantable hearing devices according to their unique needs. The program provides specialist assessments, surgical liaison and ongoing, lifelong support and rehabilitation services, delivering the highest level of care and support.